Video: Did Ultra Street Fighter II's Trailer Just Reveal Its New Mode? Capcom has already stated that Ultra Street Fighter II on Nintendo Switch will have special modes which haven't been revealed yet, but the game's freshly-released trailer appears to give of a hint of what one of them could be. Towards the end of the trailer there's a very short segment which shows the action taking place from a first-person view. Could this be a cinematic sequence or is it actual gameplay? Imagine using the Joy-Cons to throw fireballs and the like - it could be quite interesting (or terrible, depending on your point of view). Maybe it is a new mode or maybe it was part of a new load up screen. 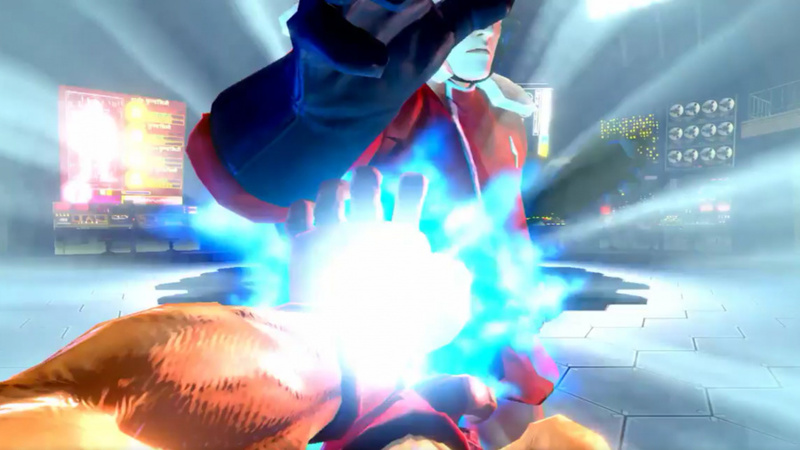 They're not limited by technology now and instead of showing the fireball face on, it's shown from Ryu's perspective. Boy, The 'HD' graphics look like ha-dookie. Now THAT would be totally unexpected...but totally awesome! Wait, not everything has been announced yet? Who could have POSSIBLY expected this?? That HAS to be SFV footage! Unless they're going to recreate Street Fighter II in 3D this doesn't make sense to me. That screenshot looks a lot like SFIV to me, though. @Tedikuma It's neither SF2 in 3D or SFIV, this is in first person. To me it looks like there is going to be an "Arms" mode where you can perform the moves & they'll be created on the screen. This would have to be done in 3D. It should be interesting... this idea didn't do well with DBZ on the Kinect, but we KNOW the new Joycons are a lot more precise, This could be a fun party mode. They should come up with a lot of new characters, stages and modes; right now, it feels like an HD virtual console title. Hope Capcom gives Street fighter 3 more love soon. Feel like they could find a new audience with that one. @amishpyrate What about Streetfighter EX? That (possibly deservedly) doesn't get much love. I was excited to play this game before this was revealed and now I'm even more curious. We already know it's a solid game so any addition is a good one. @DanteSolablood you're right. I'd honestly forgotten all about that series. Man I can hardly contain my excitement for Switch, I just wanna scream the system looks too good to be real!!! This is my DREAM GAME here. Oh my goodness. When I was a kid, I'd go to my local WalMart and compete against other kids on the demo station. There was this one guy that nobody could beat and I finally played him and what a match it was! He won the first round and I won the second and the third round we were tied with one sliver of life left for each of us. I actually ended up losing but it to this day has been ingrained in my memory. The bit at the end looked to me like a different game completely. Like SF4/5, not at all like he rest of the HD Remix graphics. Maybe they were teasing it? Man i'm looking forward too this i was hoping for a SF2 classic edition but in the style of SFV but this is cool and the first person mode looks pretty sweet tho. "Imagine using the Joy-Cons to throw fireballs" I don't have to imagine it. I've done it the same way on so many controllers since 1991, D, DF, F and a punch. All those older joy cons handled it just fine. I know, I know. You meant with motion control. I'll wait to see how it's implemented, but it doesn't sound like my kind of thing. Capcom said a while ago they were going to revist their classics so I hope this is the first of many HD remasters we'll see.Having it as a Switch exclusive should mean it sells well and convince them to bring a lot more to Switch.Final Fight HD next please. First person mode AND online? Day one! @Captain_Toad SFV is a Sony exclusive. @3MonthBeef Maybe Capcom are doing what they did in the 16-bit days, Nintendo had an exclusive on Street Fighter II Turbo so the MegaDrive got "Special Championship Edition" which was basically Turbo with a few changes. @sdelfin Have you ever played on the Fist of the North Star arcade cabinet? It has six punch pads that rotate out & you have to punch them in faster & faster patterns? It was amazing fun! Hmm... A first person POV would be definitely interesting, but I don't want to jump to conclusions. Though I prefer the good old third person POV in franchises like SF, this new mode (or call it change) could bring a lot of new players who have no experience with the series. But it could also have completely opposite effect. SF V is disappointing ? Oh, well. Another reason no buy ps4. Glad SF II return on Switch. Ah...I see why there is Mild Blood mentioned on ESRB rating box. I saw a little bit blood when Blanka was biting his opponent ( Or Vega was stabbing his opponent with his claw). Mild blood is a bit disturbing me but still tolerable for me. @DanteSolablood Capcom don't own the rights to the characters and some assets iirc. They would have to licence them from Akira. @OzHuski Indeed, doesn't stop me wanting to see it. I am more excited for this than I should. I played Street Fighter IV on the 3DS a lot, but it never felt like good old II. @DanteSolablood But it did work well with the DBZ: Budokai Tenkaichi games on the Wii, and the Joycons are much more similar to Wiimotes that they are Kinect. The Super NES is where I first take to the street and win my first fight. Now it's time to return and relive that battle again in glorious HD remastered for the new generation on the Switch. 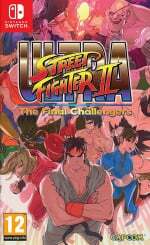 I find it a bit funny that there is another revision of street fighter 2 again! I am so ready for this game. I still play the older version on my 360 regularly. I know we cant get SFV but I'll take a port of IV if Capcom is feeling generous. It really just seems like a Street Fighter HD/Virtual Console bundled with a smidgen more. Nice to see it on Nintendo, but nothing special. @DanteSolablood I'm almost ashamed to say I wasn't aware of that. I'm happy to have seen it, so thanks for sharing. My comment just popped into my head and was more a reaction to how it was written. It was implied to be with motion control, but the way it was written sounds like, Imagine doing a fireball with the controller. I'm not really a fan of motion control and I'm not sure I'd find those punching pads so much fun, but if it's fun for people, that's cool. I don't expect every game to appeal to me. And, most importantly, if a game like this one has different modes for different people, then I have no complaints. That first-person bit was such a brief moment of the video and it may not even amount to much. If it wasn't for the article, I wouldn't have even thought it was anything more than some kind of opening movie or something. It will be interesting to see what it is. With it being the 30 year anniversary of the first game, why don't capcom just update that. Make all the characters playable, give them all their most recent move sets, an anime/manga art style, and online matches. This might have been cool if they didn't already make a SF2 HD remake 8 years ago. F it. They could keep SFV if they gave us Tatsunoko vs Capcom 2. That first one was amazing. I was excited for this eight years ago when I bought it on PS3 for twenty bucks and played it online for free. Just putting this out there - a tweet hyping up yet another rerelease of SFII with a Street Fighter V profile pic is nothing short of insulting. @amishpyrate lol at your profile pic. My sister-in-law sent me that picture a few months ago and I've been wondering about it ever since. Is it really Axel Rose, or is it (hopefully) a cover artist? Lmao last I saw him was on TV during the Guns N' Roses performance at the 2014 Golden God's Awards. Btw, I heard that Slash is back with GNR. Have you heard anything on if they're going to release a new album? Also what's that mean for Slash and Miles Kennedy?